This year is the 10th Anniversary of Matt Porter Web Design, the years have simply flown by, I can’t quite believe I switched on my brand new computer on 7th January 2003 and my new business was born!! Much has changed with web technology over the last 10 years, who would have imagined we would be SO connected to the internet? Our reliance stretches into all areas of business and life, it’s certainly been quite a ride! To celebrate our 10th anniversary, we have rebuilt our company website, take a look and let me know what you think. We also have a new page on our website, it’s called Customer Reviews. 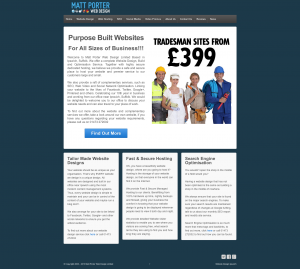 It’s there for you to tell potential customers of Matt Porter Web Design what a wonderful service we have provided you.